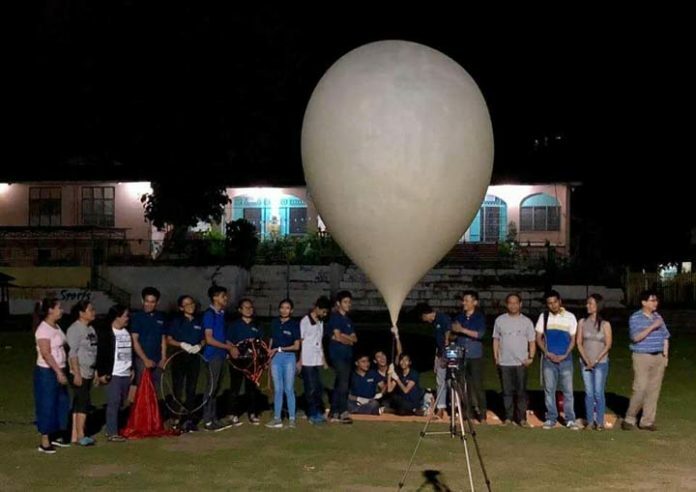 In Photo: Members of the Life Support System (LSS ) Karunungan Flight Team, students and mentors and Philippine Council for Industry, Energy and Emerging Technology Research and Development representatives pose for posterity just before the balloon launch. CEBU CITY—"The sky's the limit" seems to be a goal, not a limit, for 11 teen-aged boys and girls in Cebu province. 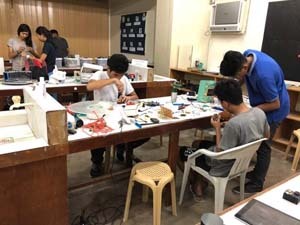 They are from Saint Cecilia College-Cebu Inc. (SCC-CI) in the first class municipality of Minglanilla with a population of 132,135 in 2015.
work on High-Altitude Balloon sensors. The young science geeks of SCC, one college and 10 high-school student researchers, are recipients of the Young Innovator's Program (YIP). • Jhy Rosheene Paunel, 18, Grade 12, wants to be a neurosurgeon. 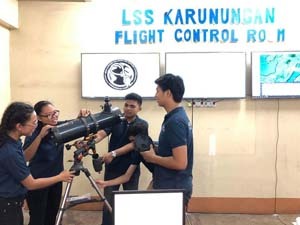 Members of the LSS Flight Team pore over a big telescope. • Joshua Pardorla, 20, first year college, is now pursuing his dream to become a computer programmer. This early, these flight team members have already set a high standard for their peers to follow. They were not alone, though. SCC instructor Wilfredo K. Pardorla Jr., 24, teacher-researcher with a Bachelor in Secondary Education, major in English, has been guiding them. He graduated from Cebu's Talisay City College in 2014. With him were Christopher Caballa Jr., and Almida Plarisan as science mentors. Space has always been in Pardorla's mind; he is now a certified science geek. He has units in solar system astronomy from Arizona State University in the United States. He will soon fly to Russia for a two-week immersion on science, particularly on space matters. On May 12 practically sleepless, tired and haggard, the team of Pardorla, mission director, from SCC launched their third High-Altitude Balloon (HAB) in the early morning sky before 3 a.m. The team had three hours of labor assembling their HAB and its payload of sensors. Pardorla said SCC is the first academic institution in the Philippines to launch HAB—and they did it thrice already. They beat bigger schools to the draw in the process. Only a few souls—mostly from SCC—were around at the Minglanilla Sports Complex and Oval, the launch site, a walking distance from SCC, as the town was asleep. After poring over the HAB and its sensors payload, at 2:18 a.m., the team of enthusiastic though anxious—with "mixed feelings" all right—they let go their HAB into the cold evening sky. As the HAB, bought from the United States for P25,000, glided overhead, gradually gained speed, until the naked eye could not see it anymore, the small throng of enthusiasts broke into a spontaneous applause—surely a much-deserved one, for the HAB and the young geeks that sent it skyward. "The launch was excellent," Pardorla said in an interview. "Among the three [HABs launched] since 2016, it was the best." He was referring to the first they set off, which hit the roof of the sport complex and landed owing to slight miscalculation. "Weight is everything in High-Altitude Balloons. A slight miscalculation of weight and there will be no lift. The weight did not match the amount of hydrogen in the balloon. So, we pumped in more," Pardorla recalled of their first HAB. Twice their HAB landed on the sea and recovered with the help of the Philippine Coast Guard. The third landed inland in Barangay Tacpao, Guihulngan, Negros Oriental, some 89 kilometers. between the two provinces. It was found and picked up by a farmer, Pedro Perolino, from Sitio Kalabasa, Barangay Tacpao, and turned it over to members of the Life Support System (LSS) Karunungan Flight Team the same day. His team's first launch caught the attention of the Department of Science and Technology's (DOST) Philippine Council for Industry, Energy and Emerging Technology Research and Development (PCIEERD). Soon PCIEERD invited them to participate in the search for its YIP. Introduced during its seventh anniversary celebration on June 29, 2017, PCIEERD's YIP helps researchers in high-school work on their passion. Only seven—five schools (one of them the SCC) and two individuals—passed the YIP's stringent qualification requirements. For YIP, PCIEERD grants as much as P500,000 for a research project. SCC received P250,000 for its HAB research project, the space technology application. Their second HAB flew on May 8, sailed into the sky and landed in the sea off Negros Oriental, and fished off by fishermen. The HAB had a payload of, aside from sensors, seven mice for an experiment on LSS in space for four hours, with a reserve for one to two hours for recovery. The second and third HAB marked the utilization of PCIEERD's funding grant. "What happened after four hours, we had ‘lost-case' balloon. More than 24 hours of search and recovery, it was recovered at sea by fishermen," he narrated. Unfortunately, the seven mice were found dead. The "capsule" that contained the mice and its LSS showed intense shaking due to mishandling by the fisherman, and a small amount of seawater was found inside. He blamed the copper tubing connected to the small external oxygen tank leading to the LSS inside. The capsule could have hit a hard object because there was a dent, detaching the copper tubing from the oxygen tank. It caused sea water to get inside. A video from one of the three memory cards (the other two SD cards were damaged), showed the mice were resting, not agitated, which indicated that internal condition was stable, he added. The HABs were meant to study the stratosphere, which is above what is called the "Armstrong Line," the area where no one can survive without a space suit. But it is not quite "space" yet. Pardorla explained that the stratosphere is the area in the sky between Earth and space. He said that for their experiment it was a perfect area because it simulates the space. The team placed sensors for temperatures inside and outside, for internal and external air pressure, for internal and external humidity, for ambient light and for oxygen and carbon dioxide. There also were two GPS devices for redundancy. He said external sensors are more complex because they have to be space-rated, which means it can survive up to minus 55 degrees Celsius (about eight times colder than a freezer). The school's HAB had a "burst altitude" of approximately 100,000 feet (30,000 meters). It means it will burst around that altitude as it could no longer take its expansion caused by the gas inside, he pointed out. The HAB has a launch volume of 11.5 cubic meters, with 2.80 meters launch diameter. Up in the stratosphere, its gas expands up to 1,150 cubic meters with 13 meters of burst diameter, Pastor said. "It took us nine to 10 months to assemble all the sensors, which included programming and various rigid testing, to ensure that it is space-rated and flight-ready," Cantos recalled. The Assembly of the entire payload train, on the other hand, took the team approximately 14 hours for the launch. A single 3,000 gram balloon costs around P25,000, inclusive of shipping. Pardorla said they are still analyzing the data from the latest HAB. In the first and second HABs, he added they were able to prove that on the stratosphere there is extreme low pressure and extreme low temperature. A human in the stratosphere without a space suit will have his blood boil and experience hypoxia. Humidity is very low; there is no vapor. Thus, in flying High Altitude Balloon, "we can simulate space-like conditions," Pardorla said.